Couple 3.2, 8 or 16 ohm speakers to 25 or 70 volt line outputs of amplifiers. Up to 5 power tap levels available (except 117F2 which has 4). Primary taps marked in watts (no calculation necessary), to match speaker power. For speaker matching from older "Classic" 600 Ohm equipment - check out our 119DA matching transformer. Insertion loss less than 2 db. Distortion is less than 1.25% @ 100 Hz. at maximum power. Horizontal, channel bracket, 2-hole (.187" dia.) mounting. All models have solder lugs, also suitable for slip on jumper connections. Total power requirements of speakers should not exceed the rated power of each transformer or rated power of the amplifier. Suitable for driving from solid state amplifiers where isolated windings are not required or can be used with our "Classic" 1600 tube output transformers to provide a 25V or 70V line output. 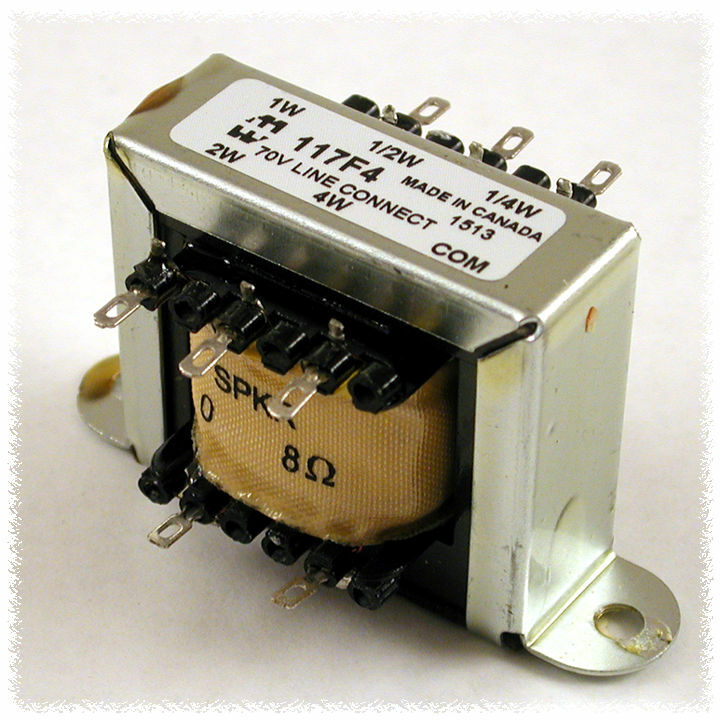 8 or 16 ohm input, 25V or 70V line output. Can be reversed for operation at high power speaker locations.